Rego: VoIP needs "the luxury of growing up a bit"
A small but growing number of Minnesotans are ditching their telephone company to make calls over the Internet. "Voice Over I.P." technology, known as "VoIP", is most popular on the east and west coasts, but its use is spreading. The rapid growth is partly because VoIP is largely unregulated. Minnesota regulators are the first to try to rein in the new technology. Shoreview, Minn. — It's not much to see, but Conal Garrity is happy to show off the new phone system in his Shoreview home. Like millions of others in Minnesota, his house is hooked up to the copper wire network installed by Qwest Communications. But Garrity doesn't use it. Instead, he relies on a small black box next to his computer. One cord runs from the box to his phone, another to his broadband cable modem. "Everything's right here. That's my local phone company, right on my desk, as far as I'm concerned," Garrity says. Garrity is one of a thousand Minnesotans to sign up so far with Vonage. The New Jersey company is the country's largest provider of residential internet telephone service, with about 100,000 subscribers expected by the end of the year. Garrity gets local service, unlimited long distance, and a host of calling features for $40 a month. He makes a lot of long distance calls, and saves up to $75 off his old monthly phone bill. He believes the big phone companies have good reason to be afraid. "I absolutely do. It's very simple to set up and you can cut the cord finally, and get away from the Baby Bells," Garrity says. Vonage and other VoIP companies send calls over the public internet backbone, turning voices into packets of digital data. Vonage says this makes it more like an internet service provider than a telephone company. Minnesota disagrees. It is the first state to tell Vonage it needs to pay the same fees and play by the same rules as any other provider of telephone service. Burl Haar, executive secretary of the Public Utilities Commission, says commissioners looked at four factors in the Vonage case: Whether a company is holding themselves out to be a provider of telephone service; whether they are using equipment that is comparable to what is used for telephone service; whether they use the numbering scheme that we use in North America; and whether the message that's transmitted altered in any way. The commissioners ruled Vonage qualifies as a phone company on all four counts, and must cease any new business until it gets certified as one. Vonage is appealing the decision. It's unclear to what extent, if any, Vonage is taking in response to the PUC's action. "Basically the commission has told them that they need to obtain certification as a telephone company," Haar says. "If they're saying they're not going to do that, then they'd be in violation of a commission order." Part of the dispute revolved around 911 service. Vonage provides 911 service, but the technology presents challenges for some features required of local phone carriers. For instance, the number of a Vonage user does not automatically appear on the screen of a 911 operator. Haar points out that at least one other VoIP provider, SurfTel Inc., has applied for and received certification in Minnesota. However, a web search did not reveal any references to SurfTel outside of PUC documents. It is unclear whether the company does any business in Minnesota. Vonage Chief Financial Officer John Rego maintains the Vonage is fundmentally different from traditional, analog telephone technology. Rego spoke from the company's New Jersey offices, over a Vonage phone connection. Rego says a phone call sent as digital packets by Vonage looks just like any other data sent over the internet by an internet service provider. "There's really not terribly much difference if what's going across the data pipe is a packetized voice or a packetized auction, or packetized gambling, or packetized gaming or e-mail for that matter," Rego says. "It's just another type of data going across a data pipe." The Federal Communications Commission could help clear things for phone companies, VoIP providers and state regulators, but so far it hasn't. Two petitions are pending before the agency, including one from AT&T and one from a VoIP provider called Pulver.com. Both essentially ask the FCC to leave VoIP unregulated. A spokesman says the FCC is "closely monitoring" the VoIP situation, but probably will not decide the issue for some time. Other issues are on the front burner, including media ownership rules and the agency's upcoming triennial review. The result is commercial chaos. Individual phone companies decide what access fees to charge when VoIP companies pass calls on to them. Companies disagree about something as basic as where a call comes from: For instance, if a call from Minnesota to Atlanta actually rides the internet as far as New Jersey, did it originate in Minnesota or New Jersey? Separate states are forming their own opinions about VoIP. Florida has signaled it will leave VoIP companies alone, but at least half a dozen others have signaled their intention to regulate like Minnesota. This confusion is what Mary LaFave, director of public policy at Qwest Communications, does not want to see. "This is an issue that has got to be resolved by the FCC, and do so before we get a patchwork quilt across the United States," LaFave says. The big phone companies differ in their opinions about VoIP, partly because many are dabbling in it themselves. Qwest will roll out a VoIP service for small business later this year. 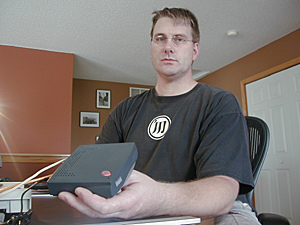 LaFave says VoIP services may not be standard phone companies, but they do need to be regulated. "Recognize that it's a new technology that has very different attributes than other services, but they all compete head-to-head," LaFave says. The ability of VoIP to prosper should not be limited, but "we ought to come up with what are the minimum forms of regulation." Vonage CFO Rego says Minnesota and the FCC should leave the company alone for at least five years. "We at Vonage don't believe that voice over the Internet never needs to be regulated," Rego says. But "we believe that it's a nascent industry, a new technology, and it needs to be afforded the luxury of growing up a bit before we worry about how to regulate it." Five years may be all Vonage needs to claim a chunk of the market. A recent study estimates the one million current VoIP users in the U.S. will quintuple by 2007.